Since January, 2007, Morinosuke Kawaguchi has been writing a column for the Nikkei BP website, titled Morinosuke Kawaguchi’s Nipponteki Monozukuri no Kigen, meaning Morinosuke Kawaguchi’s Japanese Monozukuri’s Origins. Monozukuri means making things with great skill and precision and artistic sense. This incredibly popular series of articles in Japanese often get 100,000 views a day. But since many people can’t read Japanese, here we would like to share the articles with you, in English. To our luck, we are blessed with a fantastic translator, Tom Roseveare. Thanks to Tom, we are able to share the ideas with you. Please follow our great translator’s work below and also on his Twitter account. Thanks, Tom! Find the Japanese original online here. Why does the Kabuki “Fearsome Face” stand out? “Draw a picture of a car or fish”. If asked, what kind of picture would you draw? Most readers would draw an image from the side. For a car, that’s the side with the door, or a fish with its head on the left and its tail fin on the right. It’s actually a different outcome to that achieved by a young child. Instead, you will see them drawn from the front. Whilst a car works well, the frontal image of a fish may appear to adults rather unique, right? In truth, it is a completely natural viewpoint. When we recognise things, an object’s face fulfills an important role. According to research by Professor Betty Edwards, at California State University, from the age of 10 the brain starts to process images as symbols in an attempt to optimise cognitive processing. Identifying characteristic angles of a figure helps conserve cognitive activity. When we otherwise attempt to recognise objects, from their complete visible exterior, our mind processing levels increase greatly. This outcome is “images seen from the side”. Just from intuition over theory, we can assume that when drawing a face, a child’s view of the world omits basic elements of construction and logical steps. When we become adults, we better understand these faces as we interact more. Essentially, when people come across unnatural likenesses, the mind works to make the process of association easier. Even as an adult, the strength of the child within me is a merit of Japanese manufacturing, and it is indeed a strength. The purpose of this column is for Japanese manufacturers to better evaluate their products and uncover their true Japanese essence. Through leveraging best practice examples of our manufacturing, I intend to introduce our people and culture’s true spirit and way of thinking. Today’s keyword is “face”. Modern people live surrounded by various tools. Furniture, food, clothing and industrial goods have in some way become a point of contact for human beings, with their user interfaces. Products with more function and greater appeal have diversified so now, more than ever, products that are easier to use and understand, ones with “face”, are seeing stronger demand. This is not limited to machinery, but also daily necessities, everyday items and packaging too. Try studying the front expression of Honda’s ASV-3 prototype model, originally announced in September 2005. How do you feel? It is a fairly striking appearance. No matter who you are, Japanese or otherwise, you can sense the angry expression. In truth, the bike’s face is designed to improve awareness of the bike’s presence for other road users, in order to prevent accidents. This is the main purpose of the design. Such a bike, when surrounded by four-wheeled vehicles on a highway, has a weaker presence. It becomes important to protect oneself by maximising your visibility and your visible presence. 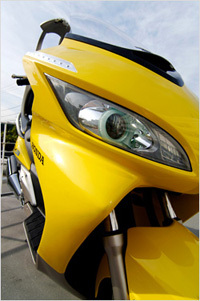 Ten years previously, the Honda researcher, Kazumitsu Kushida, alongside his team of senior researchers pursued this relationship between a bike’s front expression and its visibility, in a bid to see if it was possible to use an angry expression effectively. The front of a bike or car came to be the most important design decision in influencing a product’s image. The designer, through trial and error, who explored ways in refining this concept, concluded a conspicuous “fearsome face” was the most intuitive approach. Looking at sports bikes, such motorbikes (with their conspicuous, striking faces) are certainly here to stay. As a symbol of strength and speed, the design is a sign of fearless, high-performance and cool audacity. The designers knew men would instinctively desire this kind of bike. 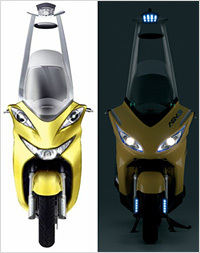 The interest in the Honda research, through exploring the intuition behind a fearsome face, proved a theoretical point. With regard to a designer’s intuition, there is an element of concealed justification, beyond which we must recognise the importance of engineering as a theoretical basis. 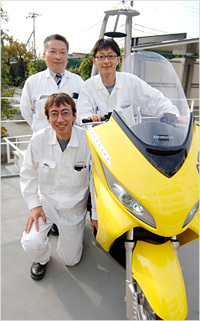 The Honda research group’s work improving safety was pioneering. The conspicuous “fearsome face” concept was also verified in medical use with measuring devices. With ”f-MRI” (Functional Magnetic Resonance Imaging) equipment, brain activity from situations where subjects witnessed these bikes was analysed, and the connection between bike design and visibility thoroughly investigated. As a result, the prototype vehicle with the “face” design came into being. 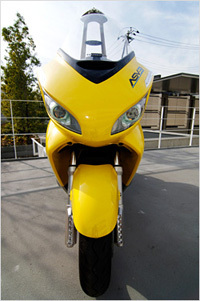 With unique diagonally-slanted eyes right up to the edge, alongside the motorbike’s front lights, a striking, powerful image of the eyes is recreated. This prototype vehicle is said to be twice as visible as comparable, popular motorbikes. With the human mind, specific brain cells are designed to help recognise facial expressions. Even up until now, computers around the world find image recognition of facial expressions an arduous task. Yet people can quickly recognise them, simultaneously understanding an expression’s true meaning. Alongside other effects, we have evolved to recognise fearsome expressions quickly, because of the impact they could have on our own existence. Whether a wild animal under attack, or opposing soldiers at war, there is no difference in their ferocious expressions. Even these days, if a boss entered a meeting room under a cloud of anger, the tension in the meeting would quickly rise. In the world of user interfaces that connect mankind with machines, there are cases where facial recognition of some individuals exceeds that of computers. Recently however, computers are improving. For example, take a look at PIN security systems at apartment entrances. An alternative method now allows the user to identify images, scenes or people on a screen, in lieu of personal identification. In place of a PIN, you can select, for example, your kitchen, high school teacher and/or favourite actress to gain access. Through leveraging people’s private knowledge to the maximum, the development of more gentle interfaces can be greatly expanded. During Honda’s “fearsome face” research development, there was internal amusement over their work’s likeness to “Thomas the Tank Engine” aesthetics. However, as if to justify their efforts, European bike manufacturers quickly started to research into the same areas. This field became a pioneering research territory, as global automotive manufacturers began to finally pay attention to this new approach. Japan was likely the first to share these pioneering results to the rest of the world. We Japanese people began to consider this personification approach or culture was now a genuine, serious phenomenon. Symbolising the recent “Cool Japan” phenomenon, both Japanese manga and anime have show incredible strength at spreading across the whole world. Less GNP, more GNC (Gross National Cool), Japan has garnered much praise and recognition. Given this background of spreading our culture, such personification faces a low threshold. Of course, personification is not a uniquely Japanese characteristic, yet our humanizing approach is gaining global attention. In everyday life, you will uniquely see such characters and mascots overflowing in our society. On commuter train doors, Hello Kitty stickers with warning signs, “Protect your fingers, keep away from the doors!” are immediately brought to your attention. These Kitty-chan images show her fingers bandaged, as an additional visual warning. Even the Self-Defence Force or police headquarters have their own mascot. Smiling faces everywhere! Drug abuse, anti-organised crime, human rights protection, the elimination of AIDS, even with more serious campaigns their essence is sometimes omitted in favour of a cute, colourful mascot character. Towns can have a fairy-tale quality to an outstanding degree, despite the reality of the outside world. This phenomenon has not just started recently. For example, our traditional customs include memorial services for old needles. Needles that have endured overuse with tough fabric, are shown what true softness is by putting them in tofu. Like the needle, we can emphasise with objects with harsh exteriors, and always appreciate our ancestral spirits. Japanese people have a very low threshold for connecting with friends and others, even motorbikes, radios and mobile phones! Even the Honda researchers who developed the “face” concept, from the emotion of the conventional Noh mask’s shadows, personification or humanising culture can simply be considered “creating an advantage, by weaving this artistic approach into our work by default”. Honda’s bipedal walking robot, Asimo, is also a symbolic example born of our humanising culture. In our world, where God presented mankind with living things, a humanoid robot walking around the living room feels like a kind of defiance to our Gods. The “fearsome face” research Honda worked on is a proud development for Japan, symbolising our research and development prowess. There was a great feeling of accomplishment for those involved in the research, to see the benefits of the research being used. Like the remote control with too many buttons, or the bulky computer manual, all too often in the pursuit of efficiency, the appearance and shape of items become disconnected from the natural, human-centric design they aspire to. For those of us born and raised in Japan, when we look overseas we can see the incredible impact of our humanised culture around the world. “I like Gundam and the Mobile Suits look so cool. 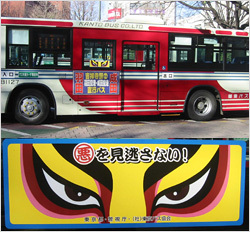 So what about motorbike designs?” With such thinking, the “fearsome face” motorbike design influenced by kabuki style is born. Next time, I will try to explain why kabuki is considered so cool. As we explore, I’ll leverage and best illustrate Japanese people’s strengths and abilities in this way. Like this, I have a great sense of where Japanese manufacturing is going. As part of the Japanese manufacturing debate, I will investigate items such as skill transmission, efficient production and production techniques. As a popular topic in the news, it is always a relevant debate. Of course, it is increasingly important ‘what’ Japan should be making and which industries Japan should be specialising in. At that point, I feel that as adults our “inner-child” approach to humanising commodities and technology will become a great strengh in Japanese engineering and manufacturing.